On the 23rd and the 24th of June, Paris worked hard to woo hearts and votes to become the host city for the 2024 Olympic and Paralympic Games. They did this by organising an amazing sports showcase with facilities in a large part of central Paris, such as a high diving board on Pont Alexandre III, a climbing wall on the Pavillon de I’Arsenal; cycling at the Place de la Concorde, sports fields on the lawn of Les Invalides and a running track floating on La Seine between Pont Alexandre III and Pont des Invalides! This temporary sports arena also happened to be just where our taxi needed to go but now could not pass through. For Parisian motorists and travellers, it meant the closure of several areas and metros; in fact, a large part of showcase Paris including roads and bridges that were only open for pedestrians. 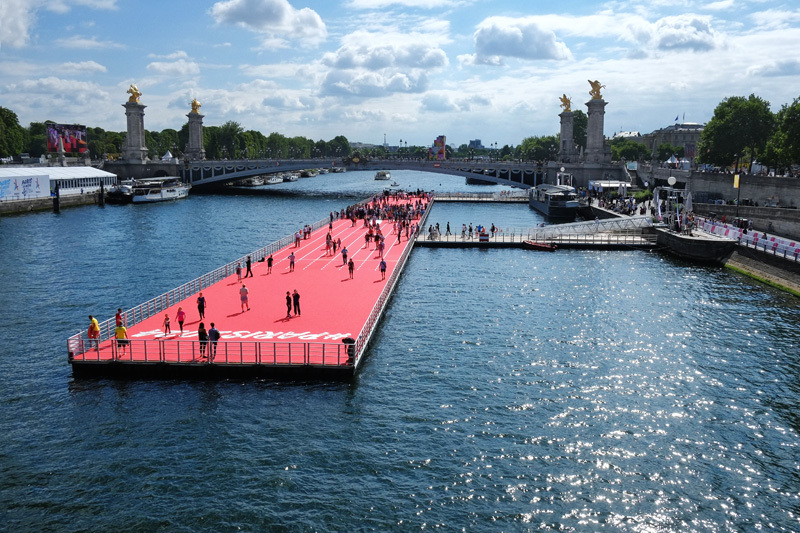 Although this did cause us some inconvenience that day, I did feel privileged to witness Paris transformed into a giant sports park and later on joined the crowd at Pont Alexandre III. Sport, like music, brings people together and the atmosphere was cheerful and exciting, it was just amazing! When it’s a big event like this, you expect lots of security. Apart from the loud and disturbing sirens from the police vans and cars, and there were quite a few of them driving through the Champs-Élysées, I didn’t mind the bad traffic at all, mainly because I was indulging in this rare opportunity to be in a taxi with a see through roof and so I was busy snapping away Paris street shots from this unusual point of view, with the oh-so-Parisian Parisien Taxi sign in the camera’s frame. More time in this taxi, yes please! 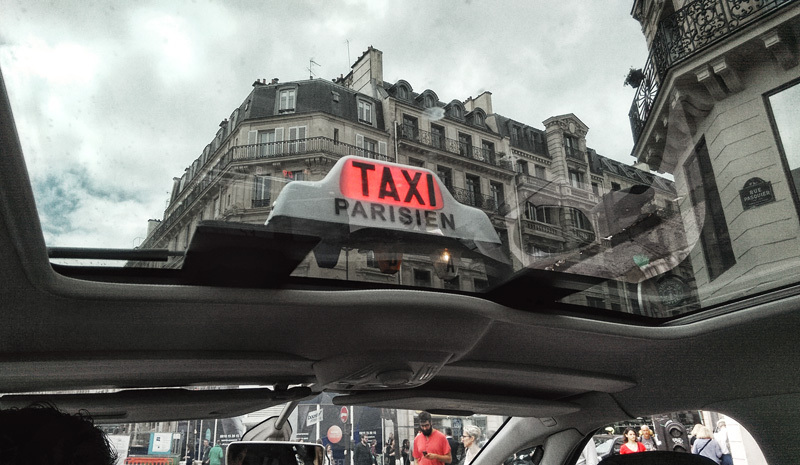 Plus, what better time than a terrible traffic jam moment to repeat the story of my four-hour-long taxi ride between Charles de Gaulle Airport and Paris to Kent and the driver. Yes, it happened to me in May 2012, a seriously bad traffic jam was caused by a car accident on the highway, and clearly, it has haunted me until this very day… I mean who wants their time to be cut short in Paris?!! ‘You think this is bad? I’ve seen worse here…’ Telling Kent by a ‘been-stuck-here-before’ Vivienne. With traffic at a standstill we took our driver’s advice and alighted the car, together with over 70 kilos of luggage (Travel light? Never heard of it!). 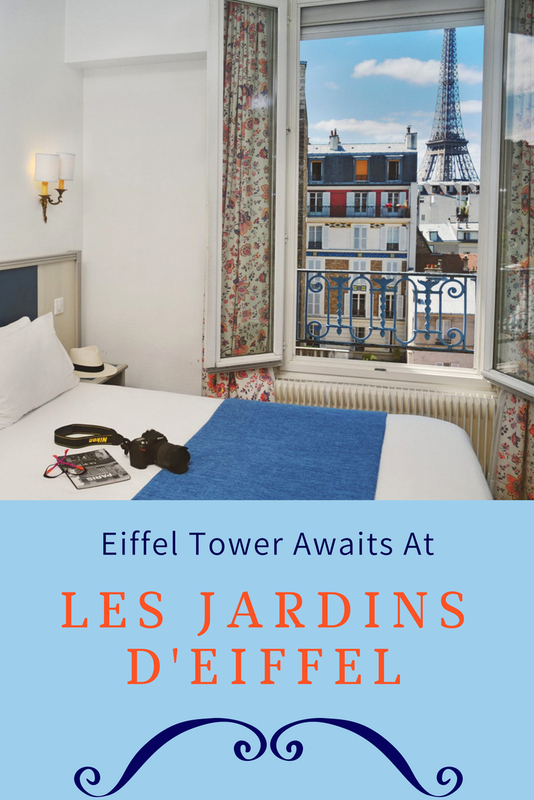 So while Kent kept an eye on our bags, I nipped down the side street, Rue Amélie and found Les Jardins d’Eiffel. The directions we were given by our driver was correct, we were pretty close indeed. So I returned in next to no time with a helping hand, our porter was friendly and efficient, he picked up Kent’s 20-kilo-plus canvas seaman’s bag without hesitation. 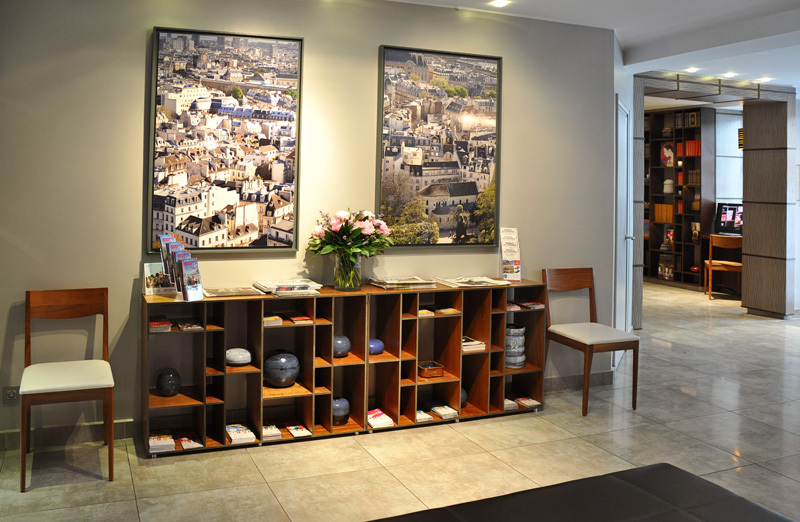 This was among my first impressions of Les Jardins d’Eiffel, which was a positive after a tricky cross town drive. After a smooth check in we headed up to our room on the top floor, the 5th floor.., having had a long taxi ride, we finally arrived at our home away from home for the next five nights. 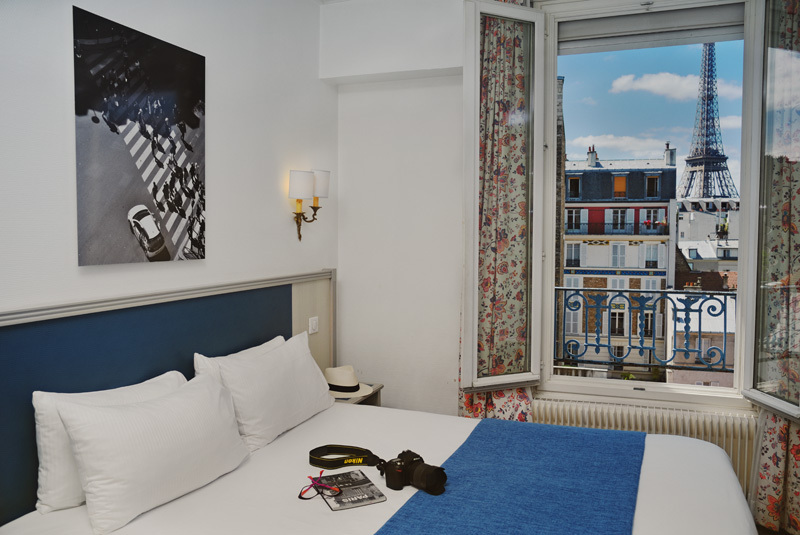 ‘Wow~’ Not even the receptionist’s words ‘we have been able to fulfil your request for a room with a full Eiffel Tower view’ could prepare me for the moment when I stepped into our room and faced this amazing view of that icon of France – la tour Eiffel! That’s our view in the photo above! 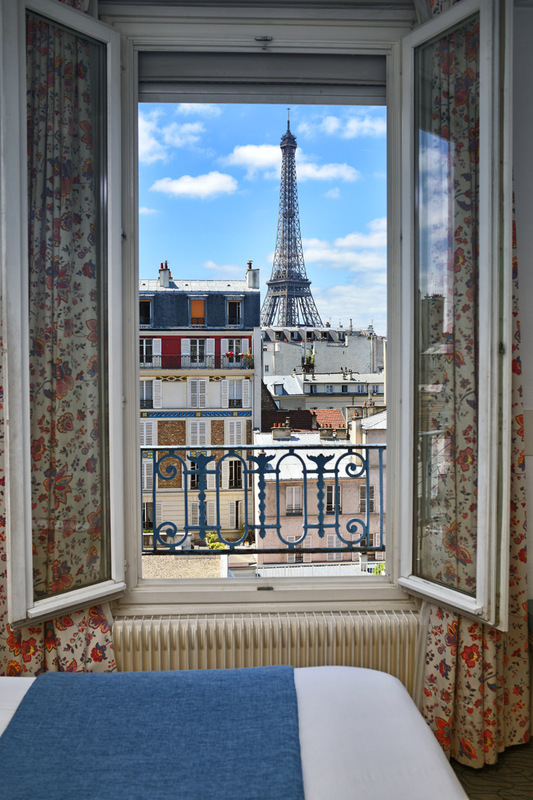 The view was true, it was a Privilege Double Room that we had. Admittedly it was minimal in size, approximately 15 square metres; the interior was rather simple and the bathroom seemed a little dated. Though having to say that, it was all lifted by this gorgeous scene from our window, our ‘real French window’ as Kent called it. For a three-star-hotel room, it’s clean, it had a safety box; hotel slippers, a kettle; a hair dryer, a mini bar, which we removed to use as our own fridge; a TV, clean towels and house keeping everyday.., oh and a bathtub which is a big tick for moi! It was enough for our last few days in France. Did I mention the view?!! Enjoying our dinner at Bistrot Chez France, Paris. Bistrot Chez France, meaning France’s home or France’s house, is a popular (we figured it out from the waiting queue) French bistro which is situated almost directly opposite Les Jardins d’Eiffel. We managed to book a table for two thanks to the hospitable and energetic France, yes that’s the owner herself. As it was already after 9PM we both skipped entrée, ‘save the entrée for next time’ as we both agreed. I went for Breast of South Western Duck, Orange Sauce and Kent’s choice was Lamb of Sisteron, Rosemary Sauce. For dessert we decided to share. Pistachio Crème Brûlée was our choice and we loved it! Cracked the toffee, yummy and creamy brûlée, ticked all the boxes without being overly sweet! And the recommended Rosé proved to be a good accompanying wine for our meal. Bistrot Chez France was full house when we came in, and it was full house when we left. 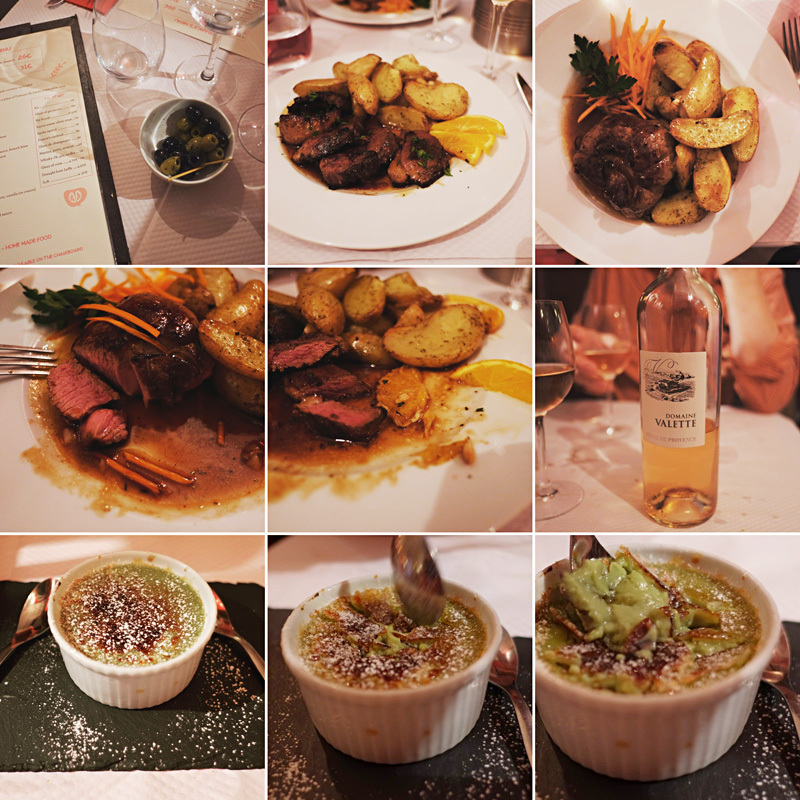 Great food, homely atmosphere; most importantly, Madame France was welcoming and had a charming charismatic verve. Shimmering Eiffel Tower, Bring It On Please! 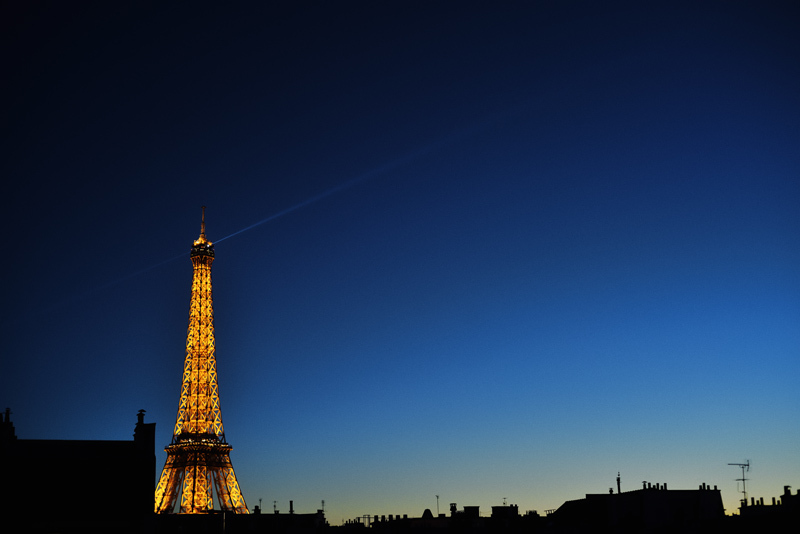 The Eiffel Tower sparkles at night after dark (in Paris summer, after dark means 11PM) on the hour for five full minutes. Knowing it is one thing but being in the right place to see it is another! And it is much better live than watching any video. This was the second time we happened to ‘walk into’ the Eiffel Tower’s sparkling show without planning it and it was every bit as exciting as the first time. We were enjoying the Paris summer night while having a stroll after dinner at Bistrot Chez France; we turned a corner and ‘Boom’, there it was, great timing! No matter how many times we saw this magic shimming tower, its wow factor has never decreased. I don’t think our Paris experience would be completed without this night view from our French window! 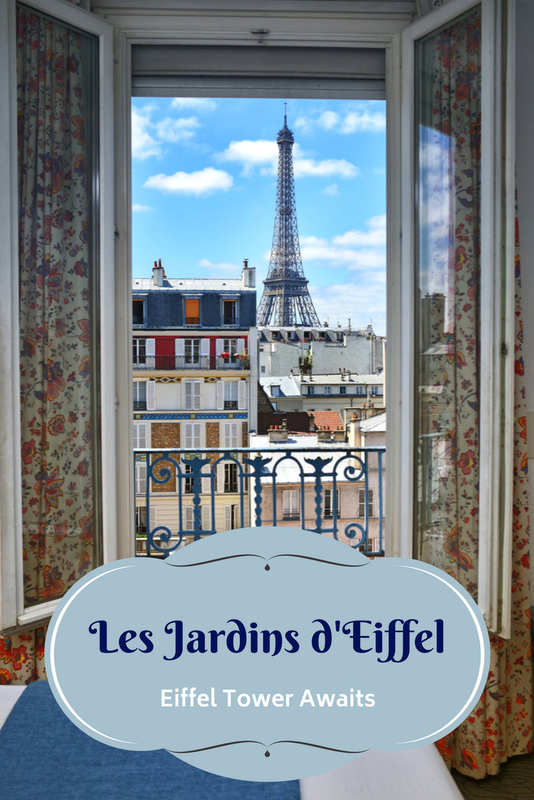 More reviews of Bistrot Chez France and Les Jardins d’Eiffel are coming soon, stay tuned! That was a tricky drive across town Vivienne, great to have had a pleasant and clever taxi driver. That Paris traffic always looks pretty crazy but it was something else on that day! Love your take on it all and the Olympic event.